Streamline your origination process and offer paperless lending – anytime, anywhere with Zoot’s origination solution. Our answer to origination completes the lending process, from application and credit scoring to servicing provider integration, all with an unprecedented level of control and flexibility. Not only does our origination solution support you with powerful tools and robust integrations that reduce data entry, it helps accelerate application processing times while avoiding costly errors. 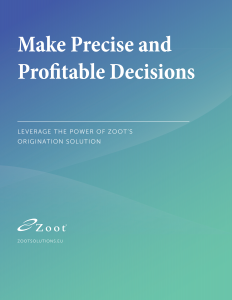 Zoot’s loan origination solution allows us to directly manage the path and flow of the application from beginning to end, where previously our level of control was over the decisioning portion. The ability to make changes on our own across the entire origination process allows us to control our own destiny. Take your origination efforts to the next level.